Problems with your toilet that you can list off the top of your head probably include a backed up toilet—which you can easily fix with a plunger. In fact, upwards of 90% of toilet problems can be fixed with a plunger. Just because your toilet develops a hairline crack doesn’t mean you need to go and throw out the entire toilet. That being said, anything bigger than a hairline crack might mean that exactly. At the least, it could require the repairs of a plumber in Simi Valley, CA. This is because your toilet holds several gallons of water at a time. If a crack were to split, you would immediately have hundreds—if not thousands—of dollars of water damage infiltrating your home. The damage can get even more complicated if that toilet is situated above the first floor. You know that sound your toilet makes after you flush the toilet? If it keeps going on and on without an end, there’s a good chance there’s something wrong with your toilet. There are many potential causes for this issue, from something as innocuous as the length of the flapper chain to a leak inside the toilet. Either way, you’ll want to get this issue fixed ASAP since it usually results in a higher water bill. Don’t be afraid to save time and call for a plumber’s opinion instead of trying random DIY fixes from the internet. Just like a glass of icy-cold water can develop condensation on the outside, a similar scientific explanation can explain why your toilet’s tank appears to be “sweating.” Toilets can develop condensation when the water inside the tank is colder than the air outside of it. This can happen due to high humidity in the bathroom, and it can be made worse by issues with the flapper. If not remedied, it can lead to the growth of mold and mildew and can rot your floors. If your toilet is having problems, it can’t just talk to you and tell you what’s wrong. It might sound like it’s trying to though if you suddenly notice your toilet is bubbling and gurgling. 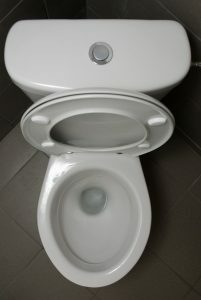 The most likely reason for a bubbling toilet is a clog in the sewer drain. These can be caused by repeatedly flushing solid objects and trash down the toilet, too much organic buildup, or an infiltration of tree roots into the sewer line. The toilet is usually the lowest drain in the system, so it’s the toilet that will be first to show signs of a backup—typically through bubbling and gurgling. Clogs in the sewer line are deeper than your average clog, so you’ll need nothing short of a professional to help with that. Having problems with the toilet? Contact Evans Plumbing Inc. today to schedule a service. Evans Plumbing at Your Door!